Mega Sale! Save 21% on the Champion Barbell 5-Pound Rubber Coated Grip Plate by Champion Barbell at Cardio Fitness Plus. MPN: 1272567. Hurry! Limited time offer. Offer valid only while supplies last. 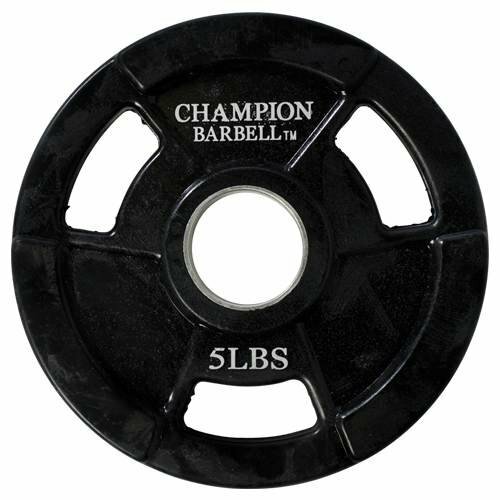 The Champion Barbell rubber-encased weight plates will not crack, chip,flake, peel, rust or tear like painted cast iron or other non-rubberplates. The Champion Barbell rubber-encased weight plates will not crack, chip,flake, peel, rust or tear like painted cast iron or other non-rubberplates. Prevents damage to floors, upholstery and will not dent orscratch expensive equipment. Reduces noise. Never needs painting. Permanently molded rubber over cast iron.